If you need a quick dessert that doesn’t require much work, it doesn’t get easier than this! 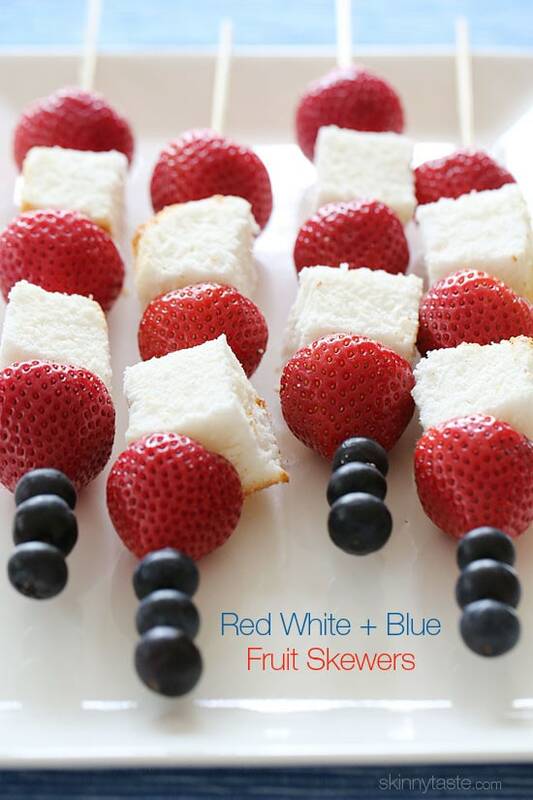 These fresh strawberry, blueberry and angel food cake skewers are perfect for Memorial Day. I’m not sure what it is about putting fruit on sticks that makes them so appealing, but my youngest daughter’s eyes lit up when she couldn’t wait to eat them. I wanted a cheesecake flavored dip so I played around with yogurt, cream cheese, vanilla and sugar, and it was exactly was I was looking for. 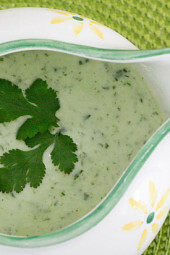 The strawberries tasted wonderful with this dip, a keeper! 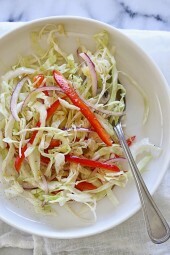 This will feed a large crowd, you can assemble it in the morning, and refrigerate until ready to eat. I would really like to know if I can replace raw sugar with standard granulated sugar? use the plain if you are used to it. If you need something a little sweeter (and can have the extra carbs) then go for the vanilla. For me I used the plain Greek. I have it on hand already and am used to the flavor. I also used splenda instead of sugar and had no problem with blood sugar spike. Do you use plain Greek yogurt or vanilla yogurt? Any certain brand? Can you use granulated sugar? I'm wondering how long this can be kept in the fridge for? I was hoping to make it ahead of time for a party. I used this as the basis to make cheesecake flavored frozen dessert (by cutting down the cream cheese and yogurt, but adding nonfat evaporated milk). It was great! Thanks! Just made this for today! It is very yummy! I did add some fresh lemon juice! Can not wait to eat our dessert! Do you use plain or vanilla Greek yogurt? Found the best app for sharing recipes ever! 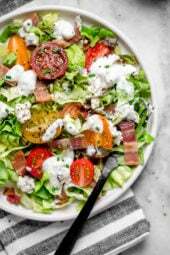 It’s called Heirloom Recipes my sister just got it today and emailed me this recipe with the link and I got the free version to try it and OMG I imported the recipe right into the app no typing or anything! The email had the link to the free one: https://itunes.apple.com/app/id617619870. I’m going to make these for our upcoming family gathering next week. I hope mine looks as perfect as the pictures of it here. Thanks!!! I am not a greek yogurt fan what can replace it? just regular vanilla perhaps? Do you have to use raw sugar? Is it ok to use regular granulated? Thank you for posting this recipe, this looks like it will be an amazing healthy treat that feels like a "cheat"! 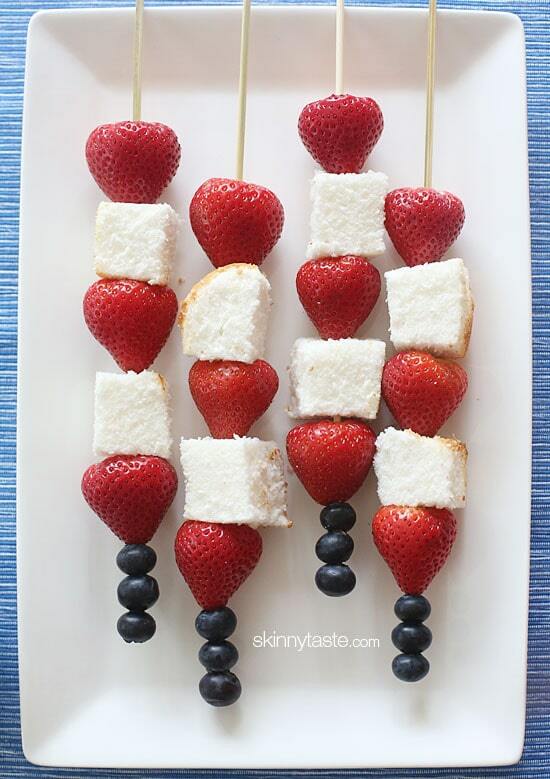 I'm so excited to try this out now, it looks like a perfect summer snack! I'm especially excited to try the cheesecake dipping sauce. How creative! I love that you include the nutrition info with your recipes–particularly the Weight Watchers Points. Oh my goodness these look so yummy! And my mom would love this. I'll have to make some for her next time I visit. Thanks for the lovely recipe! Love this! Will be making this at my next tea party. Thanks! 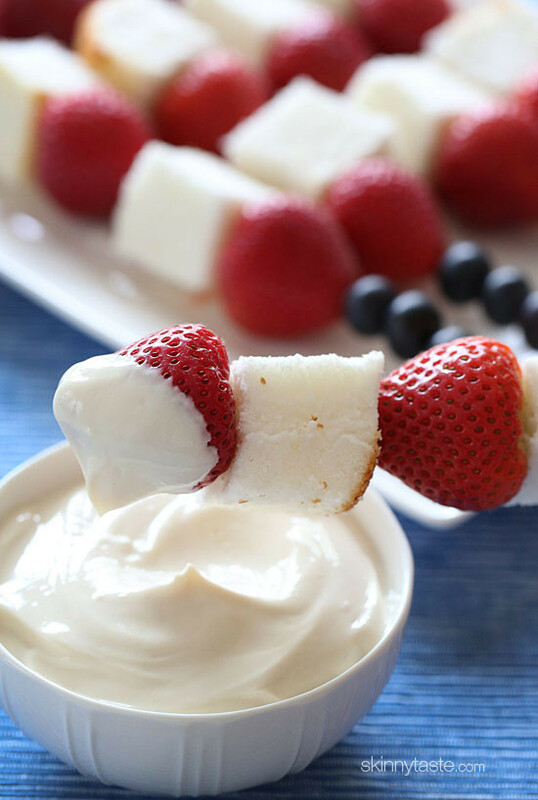 I served just the skewers on Memorial Day as a last minute treat (pulled some whipped topping out of the freezer for those who wanted to dip) and they were a hit! They looked so cute and festive on the table. Thanks! This was a big hit at our house! My light-as-a-feather 2-year old LOVED the dip, so I may be making a full-fat version for her. It definitely hit the spot! I've checked out so many other website for the recipe! Can't say thank you enough but THANK YOU!!!! We loved these! Thanks for the recipe. Gina, I hate to write this on another post, but I left a comment with some questions on your "low fat cc cookies" recipe and was hoping you could answer them for me please 🙂 I think with a little help, I can make them as good as yours! Thanks! Just emailed under my yahoo account. BTW, I don't know how you have a daughter in college when you look young enough to be in college yourself!! Lori you are too sweet! Great dessert/appetizer!! Love that it can be assembled ahead of time! What a great idea! I wish I would have read this yesterday before a potluck dinner I attended with friends. I will check your website first before my next potluck. Can't wait to make this for my next event! Mmmmm looks so good. I'm going to have to try this! What a cute idea Gina- I love summer. Such a great time for creative, light meals! Needed an item to bring to a picnic today. These are perfect! Thanks for sharing! I wonder how this would be grilled? This looks so delicious and yummy! Thanks for sharing and I will definitely try this. I love it! I have had the greek yogurt and cream cheese combination and it is fabulous! I just love it!!!! Happy Memorial Day! This looks amazing! I'm going to skip the cake to make it super-simple gluten free. My kids are going to gobble this up! I think these are just wonderful! Each Sunday, we visit as a family. (We are Italian!) My little nephew always like to make some kind of special recipe with me to share with the whole family. Some times I make trail mix, some times it's s'mores. I am always looking for something new and healthy for us to make. This will be a great "go-to" for our little chef experiences. I love all of your recipes and use them almost daily! Aww this would be perfect!! I love anything made with cream cheese. I can't wait to try it! I made this today for our memorial day party, It was a big hit with adults and kids alike. Festive, tasty and not too bad for you! I used truvia in place of the sugar and it still came out amazing. Thank you for your blog it is my favorite one!! This looks awesome and so festive! Love the cheesecake dip. Yum. OMG Gina looks great. I wonder if you could use that "dip" made into a larger batch for cheesecake? You just changed my life. I woke up this morning saying how much I really wanted a cheesecake dip that wasn't as fattening as cheesecake. What do I see when I come to SkinnyTaste? EXACTLY WHAT I WANTED! You are so right in saying that and it just what I would like too.